The Sarafan has become one of the symbols of Russia. In spite of the fact that the garment is only a couple hundred years old, It has permeated from its point of origin in the extreme northwest of the country to be found in many parts of that country. 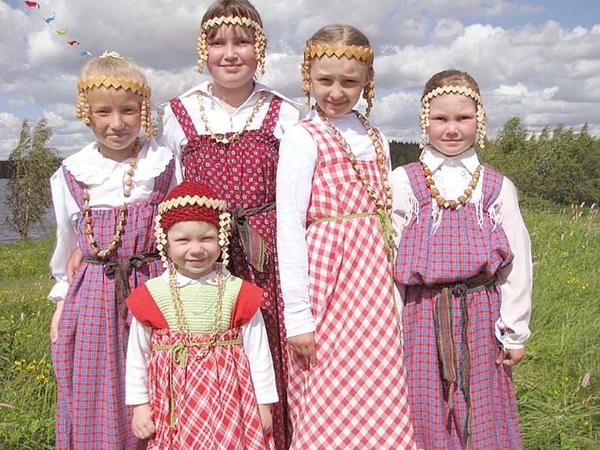 In fact, it is likely that the sarafan originated from the traditional costumes of the Finnic peoples around the area of Olonets, Arkhangelsk and vicinity, many of whom have been fully assimilated by the Russian people at this point in time. 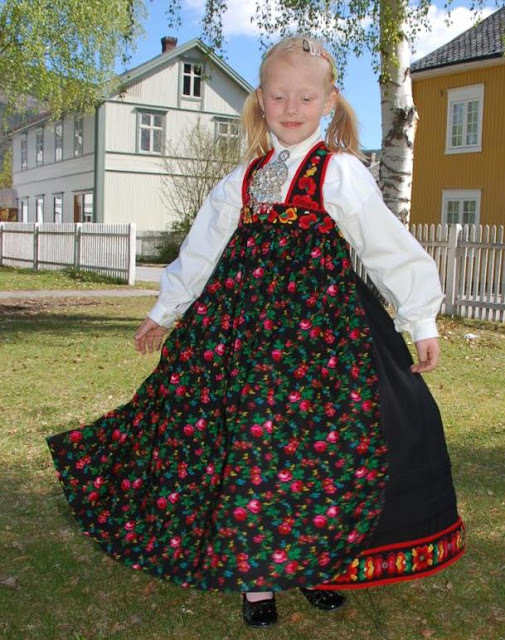 The sarafan consists of a long full skirt which hangs just below the arms and has straps or an extremely abbreviated bodice which secures it over the shoulders. The sarafan may be gathered at the top like these two examples from Arkhangelsk. Or it may be cut on an angle and flare towards the bottom, like this example from Olonets. It may be made of costly materials, like this example from the Urals. 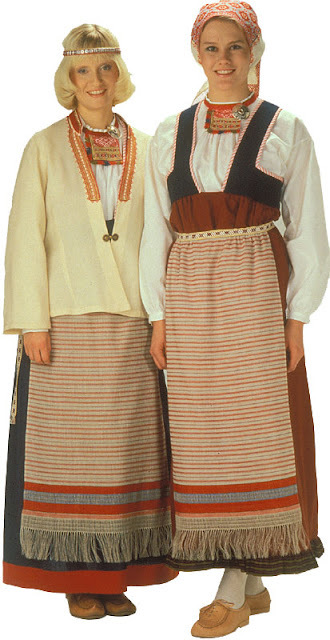 Or it may be made of homespun striped, plaid or block printed cloth, like the example at the top of the article. It is often worn unbelted, but sometimes it is worn with a sash. 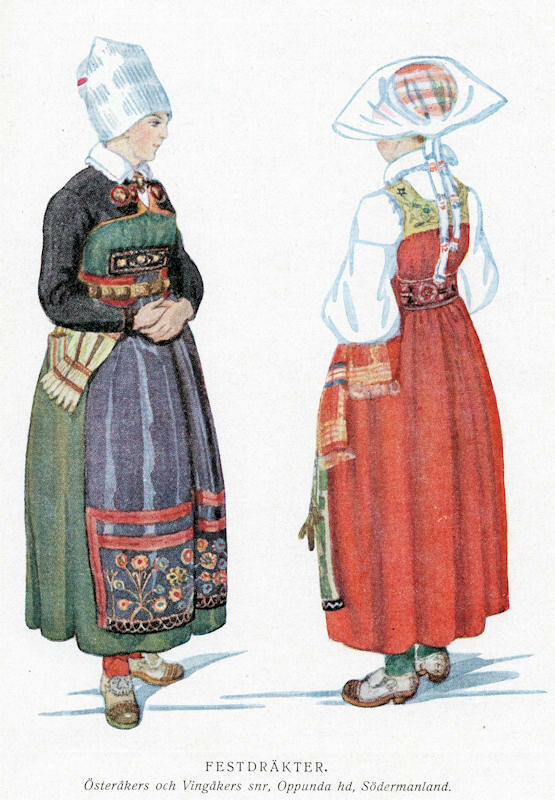 An apron may be worn with it, sometimes hanging from the waist, like most aprons do, but more commonly tied around the body at the top of the sarafan, like these two examples from Vologda. 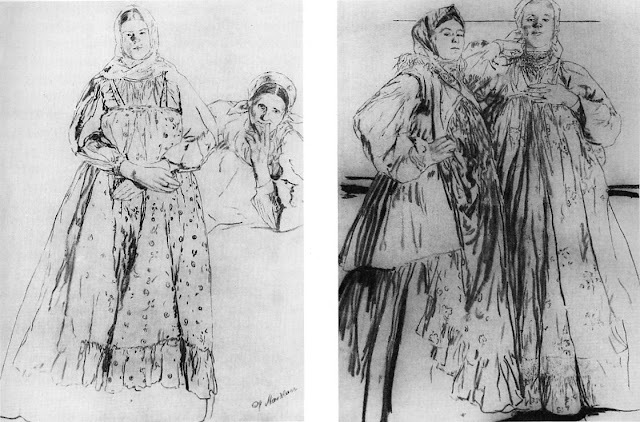 This was quite fashionable in St. Petersburg and other cities at one time, often made very full and long as in these two drawings by Maliavin, made around 1904. This basic concept has apparently been at the center of the fashion world a few times. 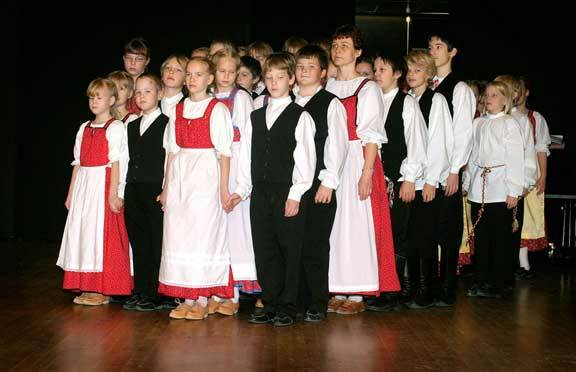 As a result, there are folk costumes which resemble the sarafan scattered around Europe. 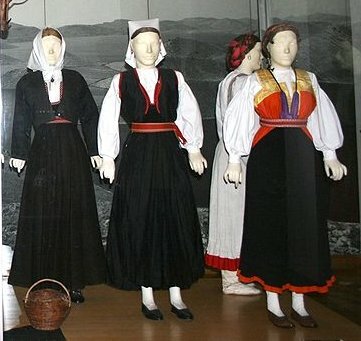 There is no genetic relationship between them, but rather are examples of a similar idea arising or being retained from popular fashion in different places at different times. Each locality developed a distinct outfit with specific forms of ornamentation and accessorization. So today we will take a tour of Europe and view various 'cousins' of the sarafan. 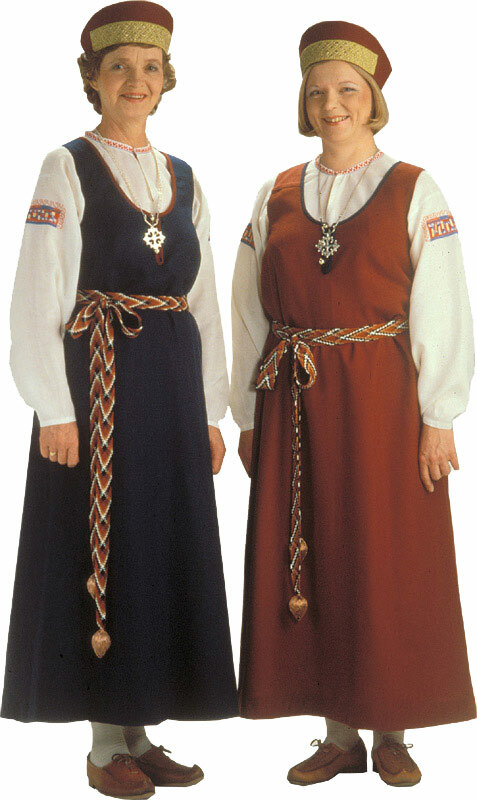 Some are belted, some are not, some have the full apron like the Russian form often does, some do not. 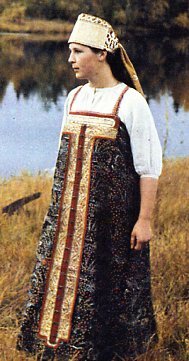 It is no surprise that the northern Finnic peoples which are within Russia, or border on Russia in Finland wear a type of sarafan. 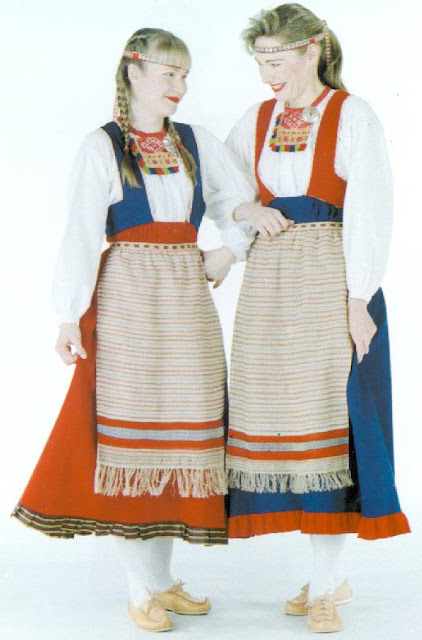 These ARE genetically related to the sarafan of Russia. The Karelian Isthmus and Ingria, which is along the coast south of the current Russian/Finnish border. 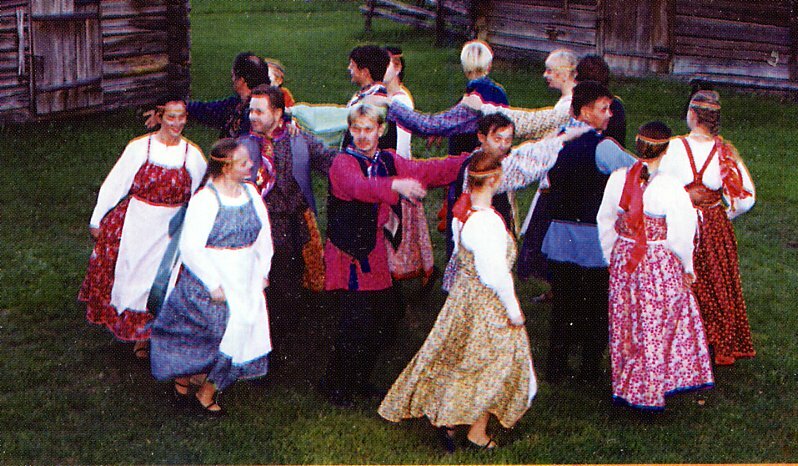 Many Finns and closely related peoples [Luud',Votes, Izhorians, etc] lived in this area before it was annexed by Russia, and some still do. The rest of the costumes I will cover today are not related to the sarafan directly. They are each found in a small area, and none are considered typical or representative of their respective nations. However each of these is alive and preserved with great pride by the local people of these communities. These two communities have very similar costumes. This type of dress is called Livkjol in Swedish. 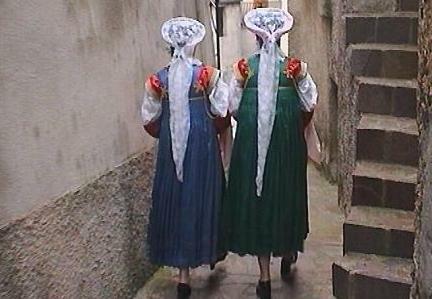 There are several similar costumes worn in various communities in this area. Of all the costumes in this posting, this one has the widest distribution. 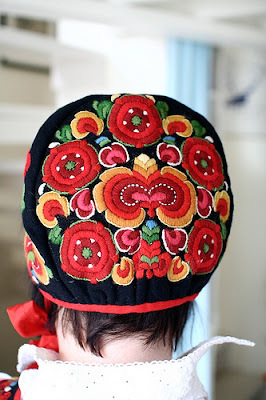 They have a very distinct form of embroidery in this region, based on Rosemaling. 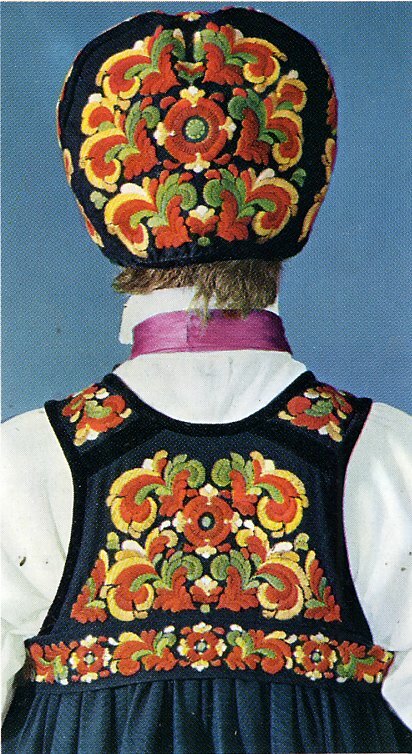 Mary Gostelow has a project based on this costume in her work 'The Complete International Book of Embroidery', however she incorrectly identifies it as being from Telemark. In Telemark they also do Rosemaling embroidery, but it is of a different style. This is a very beautiful and distinct costume. I am indebted to Marco Leon of Madrid for the following information. 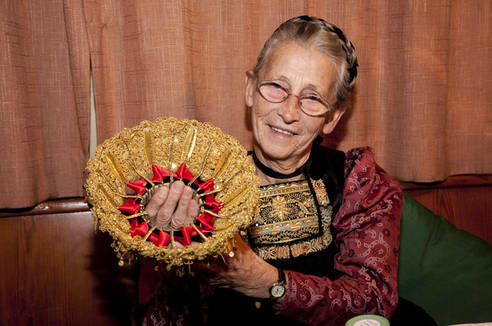 Lilla Fox writes that the term basquina indicated that the costume had been picked up from the Basques. This seems to be a conclusion on her part which in which she was apparently mistaken. 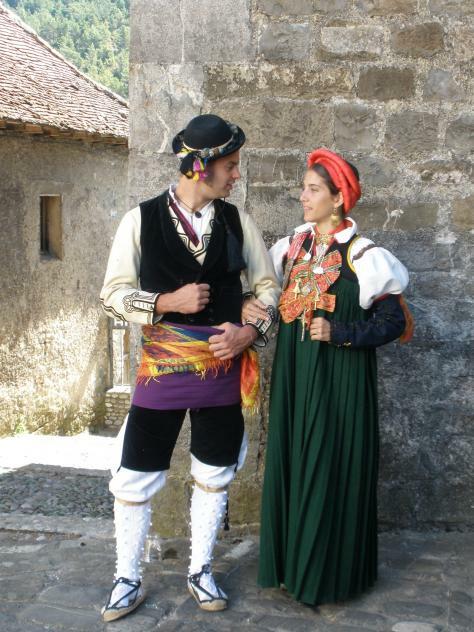 These two neighboring valleys in the center of Ticino have costumes that differ primarily in color, Verzasca having a light colored dress and that of Maggia being made of dark colors. 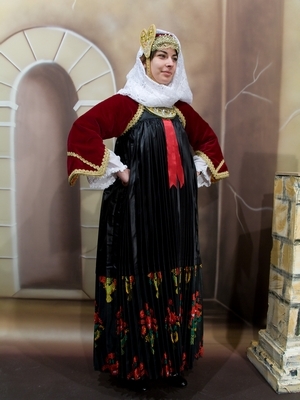 This costume has the same construction as a sarafan, but it is pleated and the upper part has the pleats sewn together, as indeed the Russian sarafan sometimes is. It is always worn with a belt. 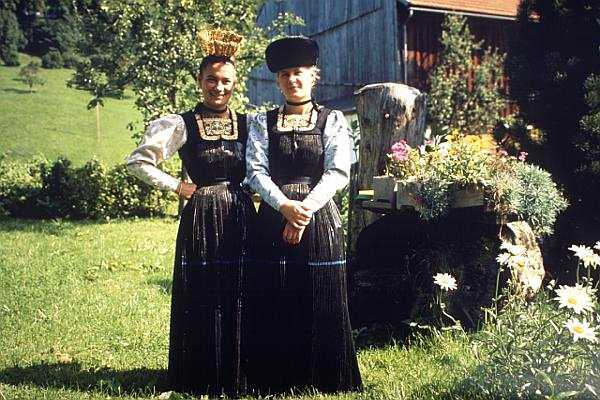 The complex gold cap for girls is found in many German speaking areas. Brides wear a larger version of it. 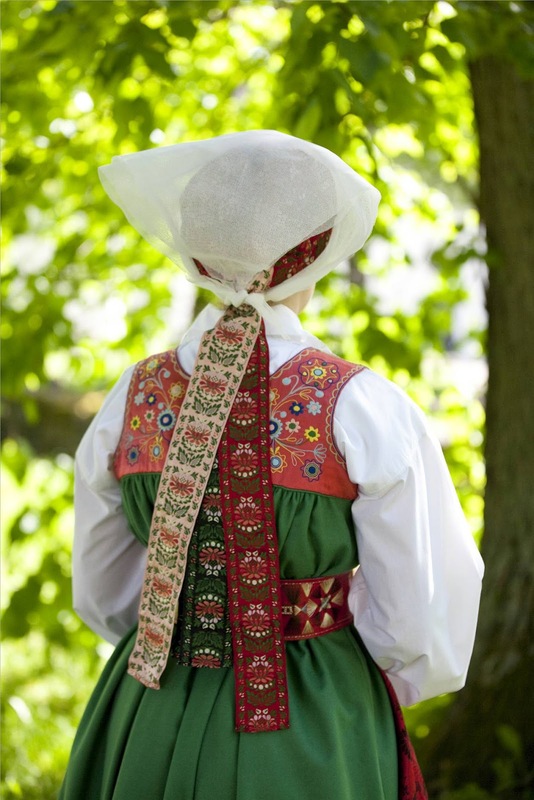 There is beautiful embroidery around the neck While this region is next to Switzerland, it is not close to Val Verzasca. This isolated community in Calabria has an interesting history. 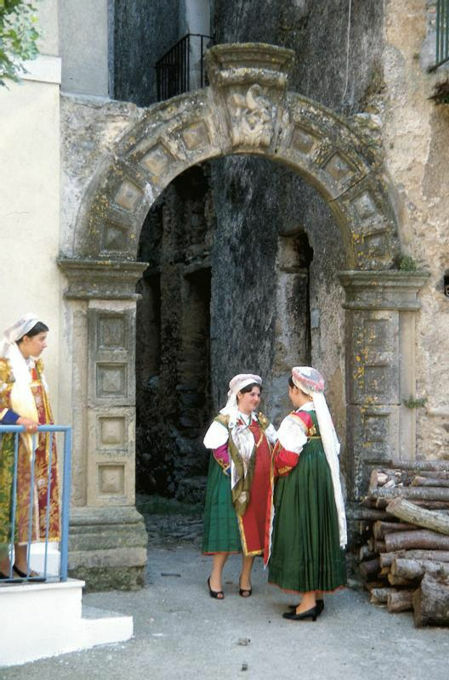 They are traditionally Waldensian, and settled in the area a few hundred years ago. They staunchly keep their costume alive, as well as their unorthodox faith. 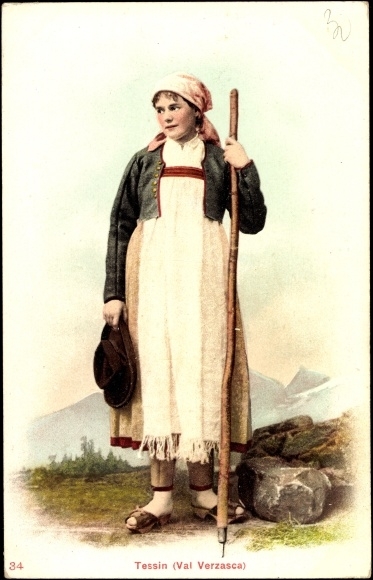 The costume they currently wear has nothing in common with that of Valais, however. 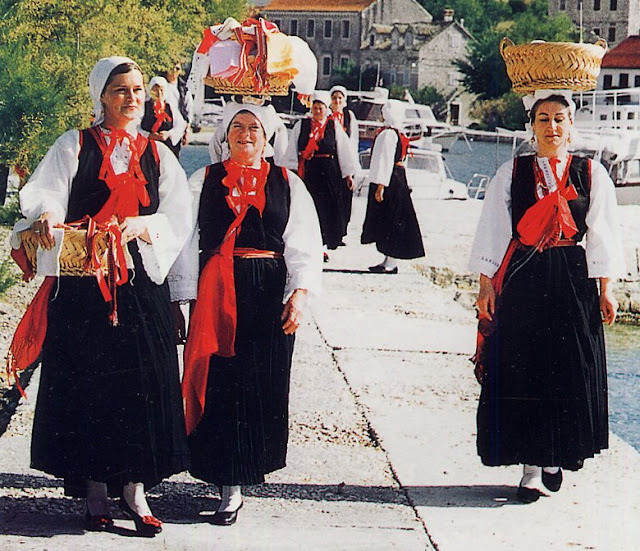 Some of the costumes found on the islands and Adriatic coast of Dalmatian Croatia bear some resemblance to the sarafan. 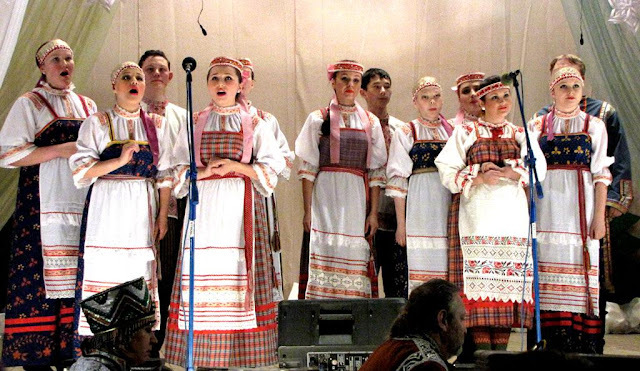 It is interesting to note that this is the only Slavic nation that I could include in this article. A couple more costumes from the Dalmatian Coast. 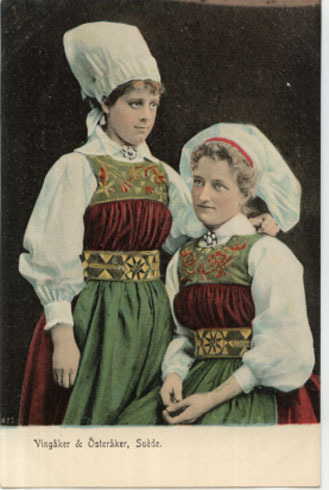 The beautiful costume on the right is a good example, but I have been unable to find out the exact community which it is from. 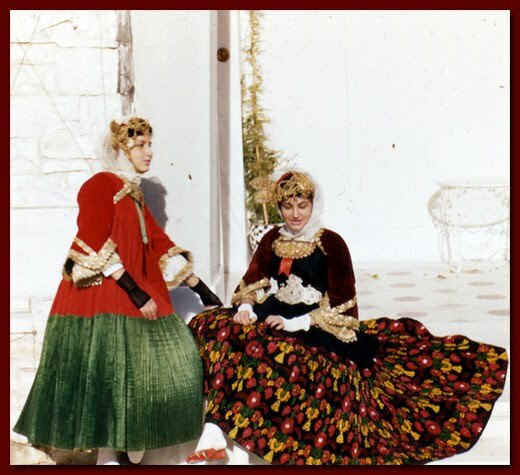 This type of costume was formerly found on Crete and other islands as well, as we know from Museum collections. 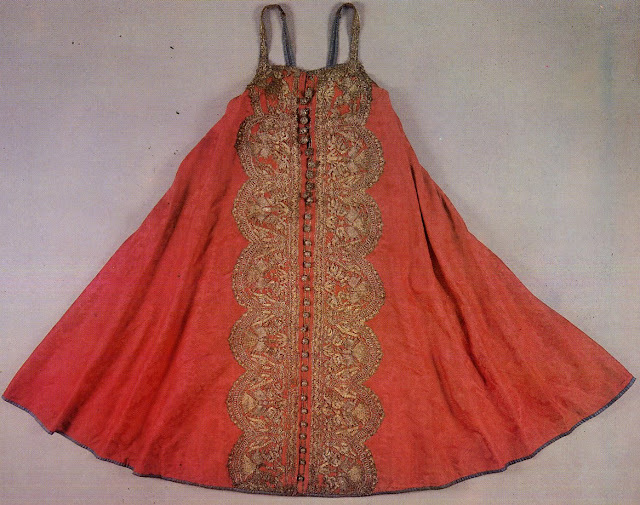 This dress is known as foustana or stofa. There may well be more, but if so, then I am unaware of them. I would be glad to include any others which you may know of, as I am always glad to learn more. 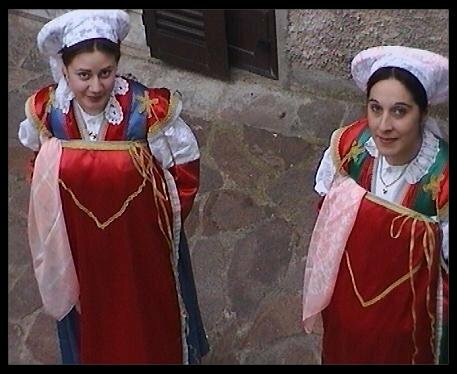 Also if anyone knows the origin of the mystery costume from Dalmatia, I would love to find that out as well. 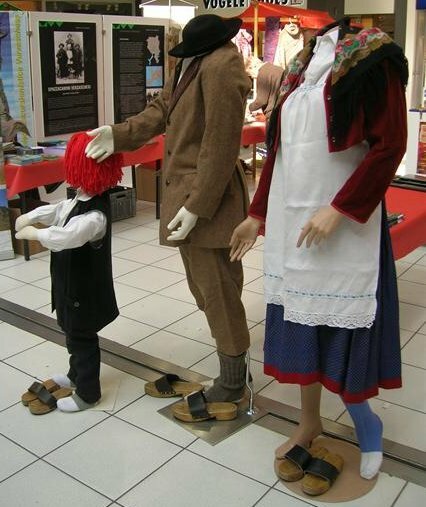 So you can see that particular concepts in costume can be widespread and may have arisen in different places at different times independently. I find this to be one fascinating example. The fact that Slavic nations are almost unrepresented in this survey lends weight to the idea that the sarafan does not have Slavic roots. This article has a very extensive bibliography, if anyone wishes information as to some of my sources, I will gladly provide them for a specific region. I will be building it slowly. I am open to allowing that, but I was unable to add it. Your wealth of information is amazing. May I contact you to show you a dress that I have been unable to identify? yes, i would be glad to look at an image and see if i could identify it. The word for folk costume is kansallispuku. 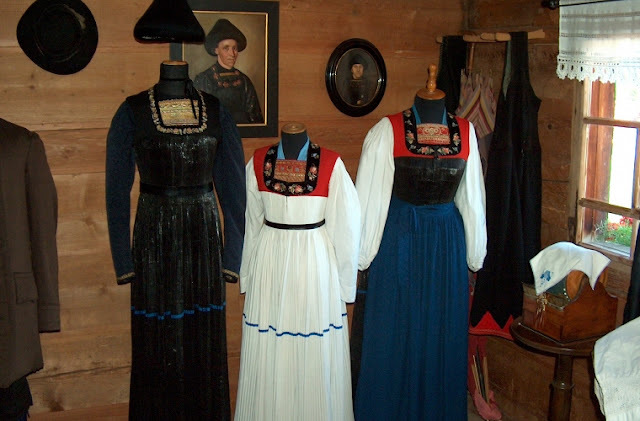 A kansallispuku can always be traced back to museum items, it is a reconstruction. A kansanpuku is a interpretation with freedom. Dear Mr. Roman: Excuse my poor english, but there is an error in the description of Ansó costume, in Spain. 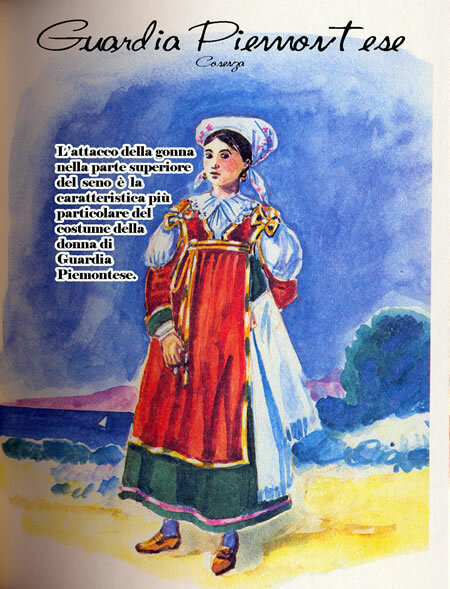 The costume is not called "basquaise". 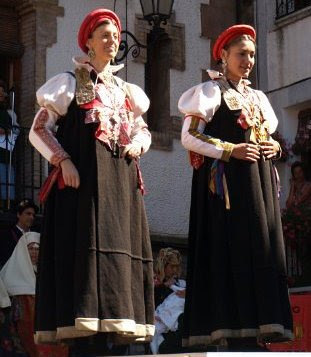 The "basquiña" is the local name for the green garment without sleeves; elsewhere in Spain the basquiña was de ceremonial skirt, usually in balck or dark colors, worn with the mantilla for going to the church, specially in weddings by the bride, over several coloured skirt and petticoats. 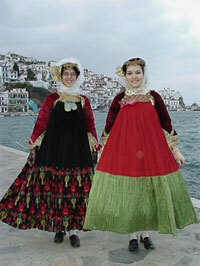 So there is no special relationship with basque costume, wich belongs to spanish (or occidental) general rural costume. 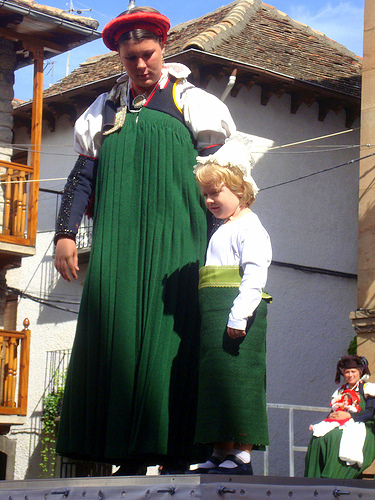 In Ansó, the black garment like basquiña, used for religious ceremonies, is called "saigüelo", and there is another dress like those called "saya" with sleeves, worn only on very special days. 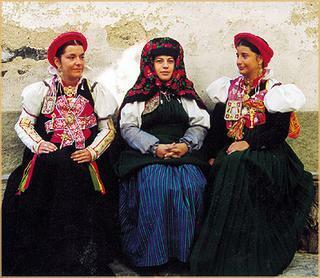 All the three names (basquiña, saigüelo & saya) have centuries of use on spanish costume, both rural or urban, refering to different types of dresses and skirts. One of the problems which I have is not being fluent in every language, which is frustrating. That piece of information I got from Lilla Fox, who is usually accurate. I admit that I have never seen the Basques claim any costume which is similar. 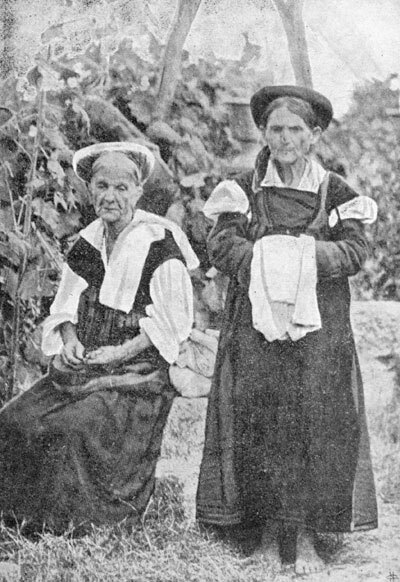 The term baquina must have been originally adopted from the Basques, perhaps as a way of making it sound exotic, as happens so often with clothing. I would love to see an example of the saya. The word saya is very widespread, I have seen it in several languages. Thank you very much for giving me more accurate information. I would welcome any more information and images which you have. My library on Spanish costume is relatively weak. Currently I am researching the Montehermoso costume, and I would like to do another article on the simpler version of the Salamanca costume, especially on the blouse embroidery. "In spite of the fact that the garment is only a couple hundred years old.." Первое упоминание сарафана в русских летописях - XIV век. Этимология самого слова сарафан - ирано-персидская. От туда же и попали в Россию первые сарафаны, которые, кстати, изначально были мужскими. В женском гардеробе сарафаны закрепились во времена царя Петра первого, когда центр страны (не только территориальный, но и "генеральный план развития") сместился на северо-запад страны. Вообще, схожую по крою одежду можно найти во всех частях евразии, потому сейчас уже точно не разобраться от куда он вообще взялся. 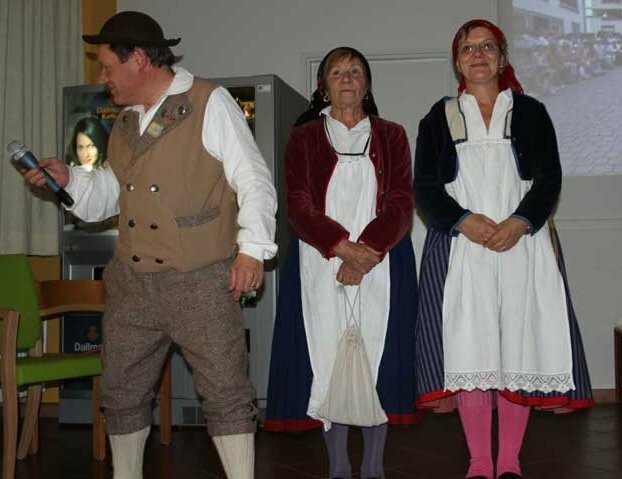 As this is well showing, Europe is fabulous continent when you will discover to europe then you will find many type of costumes which are very popular in whole world. 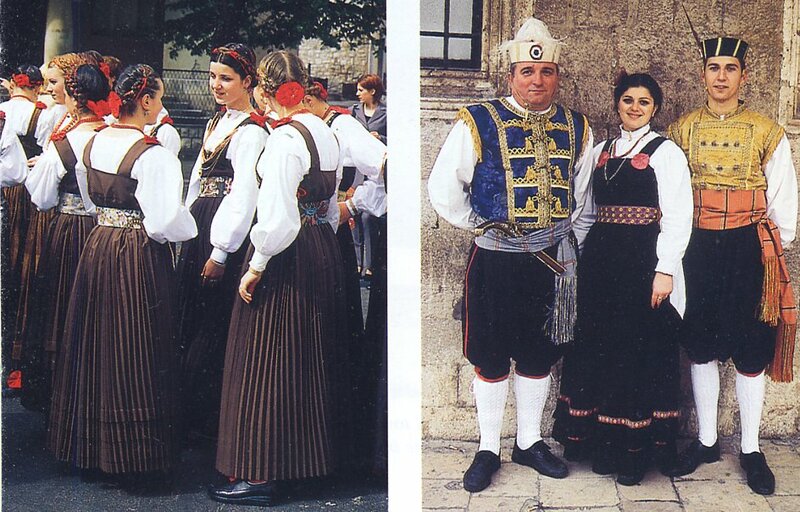 This makes it a real pleasure that europe has many type of cultures. Here I also read about embroidery. Like it while it's on embroidery, It is really fabulous technique of cloth designing and I also search an online store about embroidered cloth, that online store name is IMAIMA. 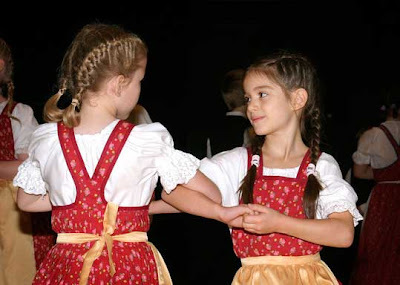 It is one of the expertise level online stores for hand embroidered dresses and these clothes are also less expensive. I am looking for patterns for the sarafan for women and children.Can you direct me where to find them with English instructions and measurements.I am from America and would love for my daughters and I to wear these as everyday dresses.These dresses are so exquisite,they could easily be worn daily.Thankyou. I would like to say thank you for your high-quolity blog. I found a lot of great information about different cultures. 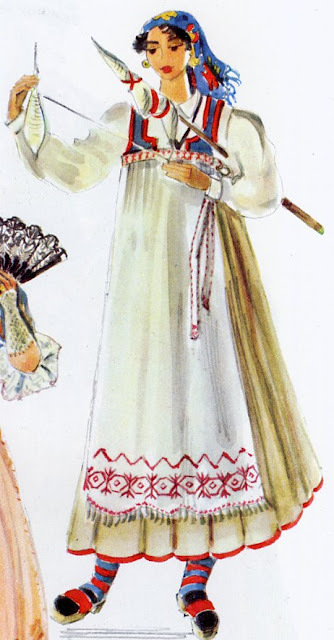 ideological part of the traditional Russian costume. 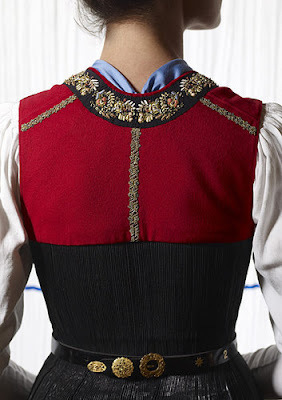 Embroidery on clothes had sacral and protective functions and was necessarily present at the neck, hem and along the bottom of the sleeves of the lower shirt. 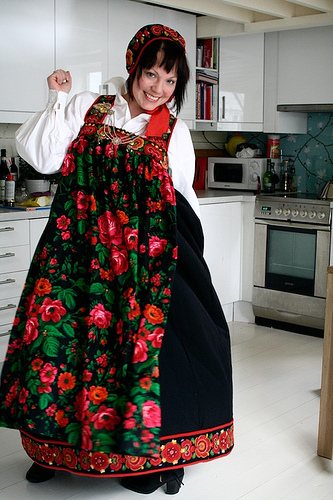 By embroidering an apron from a woman, you could find out her entire history: her age, preferences, the number of children and even their state of health, as well as deceased relatives. Married women necessarily hid their hair under their magnificent hats so that they were not visible - this was very important. 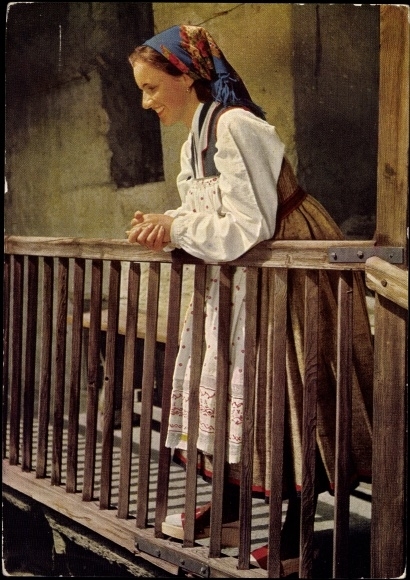 In this regard, the illustration in your material and some photos do not correspond to the age-old Russian traditions. It was also mandatory to wear a belt, which were completely embroidered. The belt also performed a coastal function. Belt must be worn from birth. At first they were surrounded by outer clothing, closer to the 19th century (if I am not mistaken) they began to be worn under it.